The CIA, the military industrial complex and other elite elements within the US are redoubling their efforts to remove or at least contain U.S. President Donald Trump. The accusations that Trump is a kind of Manchurian candidate, functioning as a puppet of the Russian President, have not diminished in spite of being contested by independent journalists and a group of retired Intelligence officials, not to mention Russian government officials. Intelligence agencies argued last year that there was clear evidence of Russian government-authorized hacking that interfered with the outcome of the 2016 election. In January, unverified and unproven claims were disseminated alleging that Donald Trump had had escapades with prostitutes in a Moscow hotel room. Government officials argued that Russian Intelligence may have video-taped the encounters giving President Putin ammunition with which to blackmail the leader of the free world. Then in February, a massive blow: Michael Flynn, a Trump ally within Cabinet, was forced to resign his position as National Security Adviser on the questionable grounds that he had failed to accurately disclose the contents of a conversation he had with the Russian Ambassador to the US. The most recent coup de Grace came when another Trump Administration official, Attorney General Jeff Sessions, recused himself from the probe into Russian interference in the 2016 election on the grounds that he too had failed to disclose conversations he had had with the Russian Ambassador. 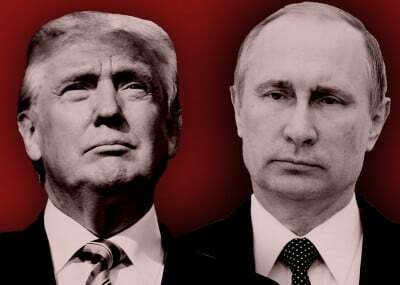 On this week’s episode of the Global Research News Hour, we hear from James Petras about why Trump’s enemies within the CIA, and the Deep State generally, are invoking Russia as a cudgel with which to beat the billionaire president. He also reflects on the hazards of authentic progressive movements aligning themselves with these elements within the ruling elite determined to bring down Trump. After this interview we spend time examining the Canadian government’s response to the Trump Administration, especially in the wake of the Canadian Prime Minister’s February visit to Washington and a controversial shuffle of his Cabinet. Roger Annis helps listeners understand these international dynamics and what is at stake for Canadian domestic and foreign policy. Finally, Barrie Zwicker returns to the show to share his reflections on the President’s February 28 speech to Congress, and suspicious omissions in major media coverage of that event. James Petras is a retired Bartle Professor (Emeritus) of Sociology from Binghampton University in Binghamton, New York, and Adjunct Professor at St. Mary’s University in Halifax, Nova Scotia, Canada. He is the author of 62 books published in 29 languages as well as numerous articles published in professional journals. He is a member of the Canadian Dimension editorial collective, and has contributed to independent news publications including Counterpunch, Atlantic Free Press, and Global Research. Roger Annis is a socialist, a trade union activist and a retired aerospace worker. He has written extensively on peace and social justice issues. His articles can be found at rogerannis.com and on newcoldwar.org, which he also edits. Barrie Zwicker is a retired print and broadcast journalist and a media critic. Some of his most recent articles appear at truthandshadows.wordpress.com.